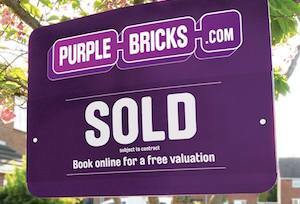 Purplebricks only went live last April, but its fixed fees have won plenty of fans. Going from inception to IPO in less than two years is a pipedream for most start-ups, but online estate agent Purplebricks may have done it. It’s understood to be considering a pre-Christmas IPO that could value it at up to £250m. Sky News reported that the start-up told shareholders that it wants to float, ideally as soon as the first week of December. Sources close to the company told MT it was ‘looking at options’, but hadn’t actually made any decisions. If the super-speedy IPO does go ahead successfully, it would be a homegrown tech success story, the likes of which are normally associated with Silicon Valley. It would also be yet another accolade to add to ‘superstar investor’ Neil Woodford’s seemingly never-ending list. The much-feted fund manager put £7m into the online estate agent in August 2014, which at the time was said to be 30% of the young company. That was after investors including former Capita boss Paul Pindar put in £3m before it was even launched by brothers Kenny and Michael Bruce. A year later, Sky News reported he’d raised his stake to more than 25% in a funding round valuing it at £100m (if both are true, one would assume more shares were issued). At the end of September, Woodford Investment Management declared holdings in Purplebricks worth £42.5m. So what’s all the fuss about? Relatively low fixed fees - £665 plus VAT, compared to a commission-based average of £5,600 – have reportedly made Purplebricks the fourth-largest UK estate agency by fee-paying customers. It still offers valuations, professional photography and help with arranging viewings and negotiations from ‘local experts’, but having no stores helps keep the costs low. It isn’t the only online estate agent causing headaches for its high street counterparts. HouseSimple bagged investment from Carphone Warehouse co-founder Charles Dunstone, while easyJet founder Stelios Haji-Ioannou launched his tango version (easyProperty, obvs) last year. It does, however, have 60% of new online instructions, according to Sky News. Whether the supercharged start-up successfully floats or not, estate agents would do well to stop carping on about Zoopla and Rightmove and watch their bricks-and-mortar backs.